With summer in full effect, there’s no better time to wash your vehicle. 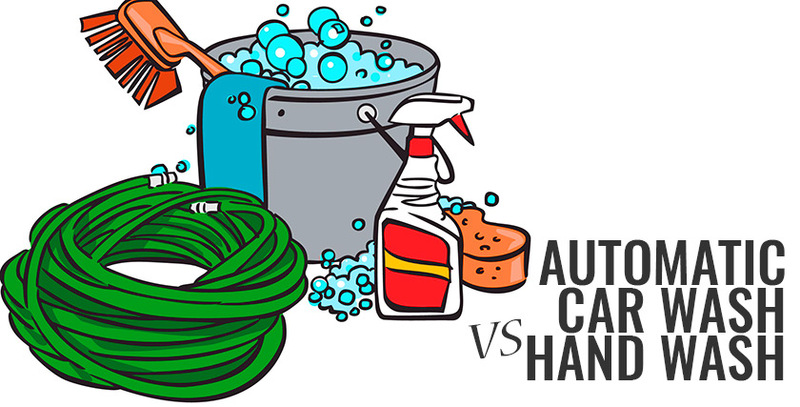 Determining whether to go to an automatic wash or do it yourself can be a tricky decision, as there’s really no right or wrong answer. Choosing the best method will depend largely on your personal preferences, so read ahead to find the optimal choice for you. The obvious advantage of going to an automatic car wash is the time and convenience factor. We all have busy lives, and may not have the opportunity to fit a long hand car wash into their schedule. Depending on how thorough you are, washing your vehicle by hand could take up to an hour to complete, while an automatic wash can be completed in just a few minutes. Unless you know what you’re doing, you could easily scratch your vehicle if you do a poor job washing it yourself. If you have little confidence in your abilities, it’s likely in your best interest to leave it to the machines. While automatic car washes are certainly more convenient, they may not be the best for your vehicle’s exterior. If the wash is done poorly, it could leave smear marks that could become almost impossible to remove down the road. While washing yourself will undoubtedly take more time to complete, a little elbow-grease could also be worth it in the long run. As long as you know what you’re doing, hand washes typically do a much better job of cleaning the vehicle. If you’re willing to spend the proper time, you’ll likely be able to remove more dirt and grime compared to an automatic wash. Washing a vehicle yourself will also give you the ability to wax and polish your vehicle, helping to remove any extra debris and give your car a brand-new looking finish. Finally, most automatic car washes will use either air drying or blow drying. Both of these methods are more likely to leave water spotting that could remain on your vehicle for years. Using a micro fiber cloth during your hand wash can avoid these problems entirely. If you value your time above all else, automatic car washes may be the way to go. Sure, they can be a little harsh on your car’s exterior, but the time you save could may be a balancing factor with the mild risk. Also, depending on who you are, your car’s ability to get you from point A to point B may be all you really look for in a vehicle. If you truly care about properly maintaining your vehicle, you should find the time to regularly wash your car by hand. Doing your own wash will help to get at spots that an automatic wash couldn’t dream of getting, and will have your car looking newer than ever.